When I first started thinking about making the switch to natural and non-toxic products, whether this was cleaning or body products, I felt overwhelmed. Really overwhelmed. I didn’t know where to turn or how to go about the process of finding products made with safe ingredients. Baby steps: I’ve been on this journey for 10 years. It’s taken me 10 years to get to where I am today, and even now I’m still learning and growing and making changes. Small, intentional steps are the key to a long-term lifestyle. The goal is never some kind of perfection; rather, the goal is intentional living and progress. Start with products you use regularly: Here’s the thing. 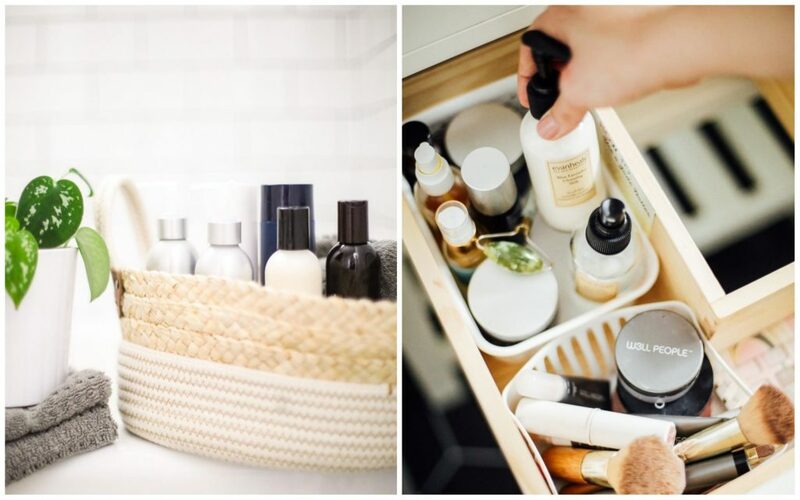 You may want to switch over your entire bathroom cabinet right now, along with all your cleaning products, but doing so would cost a fortune and won’t give you time to find the products YOU love. Plus, you may drive yourself and your entire family crazy (trust me on this one ?). I recommend slowly making changes, starting with one product at a time. Which product should you choose first? When it comes to body products, start with the one you use most frequently and the one that comes in direct contact with your skin. Maybe this is lotion or foundation? Maybe this is your facial moisturizer? Maybe this is deodorant? Maybe this is toothpaste? As you run out of product, slowly make changes. It really can be that simple! This slow approach can be enjoyable and empowering and an approach that makes a long-term impact on your lifestyle and health. Let’s talk about practical tools that will help you make the switch. The following resources have helped me find non-toxic products and brands and be an informed consumer. Knowledge is power. When you have the tools to educate yourself about ingredients and products, you have the power to make informed choices about what you consume (food), as well as what you use on your body and within your home. 1. The Environmental Working Group or Think Dirty App. There are currently two watchdog groups that can help you make informed choices about products: EWG Skin Deep and Think Dirty App. The EWG’s Skin Deep site offers a consumer the ability to look for specific body products, by brand, or look up specific ingredients and view their ratings based on a 0-10 scale. The Think Dirty App is a phone app that provides similar information as the EWG, including number ratings for products. This App is particularly helpful if you’re in a store and need help with reading a product ingredient list. Neither database is perfect and you still need to use your own discernment when navigating the information, but both resources can be super helpful and a great place to turn when looking for information about specific products and ingredients. The Detox Market lets you pick up to 4 products to sample with My Little Sample Bag. This is a fantastic way to try hair and body products before making a final purchase! It costs $7.99 for 4 products, which is a small price to pay compared to dropping hundreds on multiple products that you may or may not love. If you try a product and love it, order a larger size. If you don’t, move on. Need help with determining what to try? I share my favorite skincare brands in this post. 3. Take a Skincare Quiz. When it comes to finding non-toxic skincare options that will work for your skin (everyone is different), Follain offers a free customized quiz. 4. Visit a Green Beauty Store. 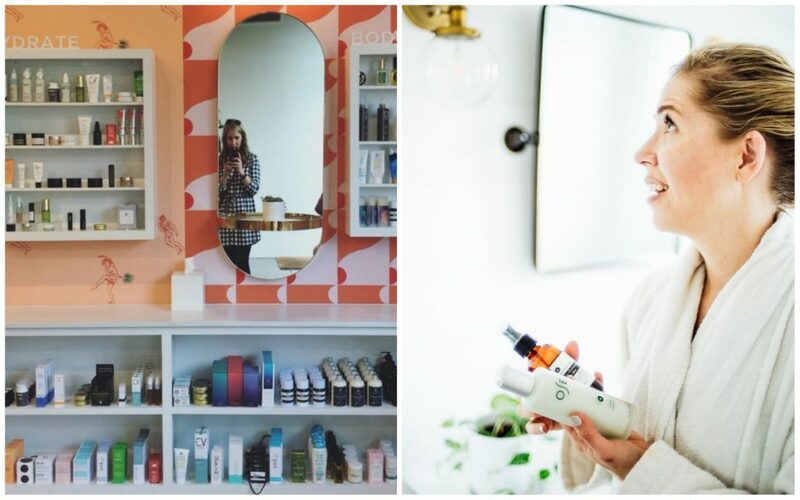 Green beauty stores are few and far between, but they do exist in some states (and countries). Follain, Detox Market, Credo, AILLEA, and Lemon Laine are just a few of the stores you can visit across the US and Canada. Most of these stores offer samples or you can try product while in the store. And most of these stores curate product, so they only sell what they believe is the “best of the best” in the world of non-toxic body-care options. A health food store can also be a valuable resource for finding products, but you’ll need to do your homework since most stock a ton of product (and usually only bigger brands) versus curating the “best of the best” and smaller brands. Even Sephora and Ulta sell some products now, but it’s hard to know what’s actually a non-toxic product and what’s not. 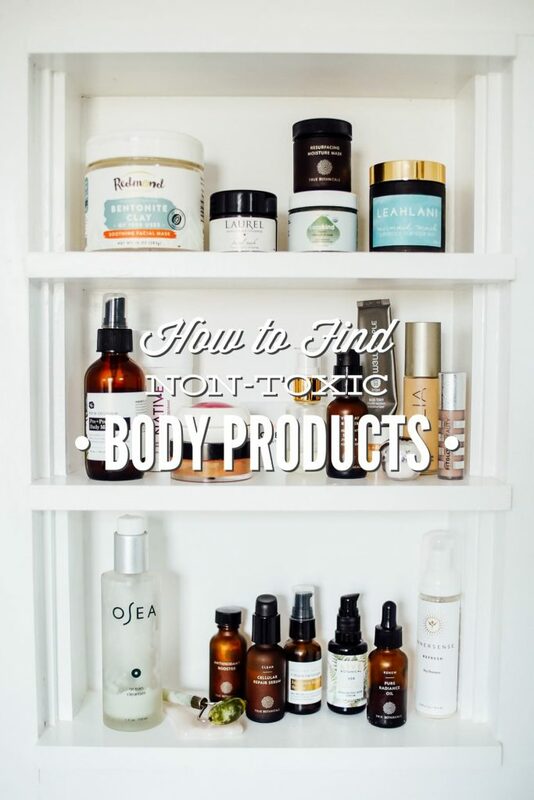 If you’re new to non-toxic body products, Sephora and Ulta may not be the best options, unless you’re going in specifically for a product you already know about. Target is also expanding their “natural skincare” section. I’ve seen Dr. Bronner’s (my fav body soap), Acure, and S.W. Basics (all non-toxic body brands) in the store and online. 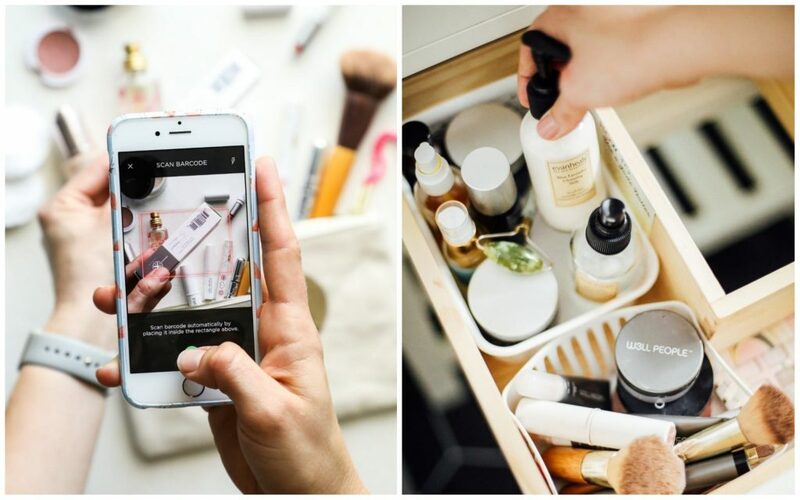 Target doesn’t curate product or even have a strict qualifier for what’s considered a non-toxic or natural product (these terms aren’t regulated), so you have to be careful and do your research–this is where something like the Think Dirty App can come in handy. 5. Make The Switch Series. 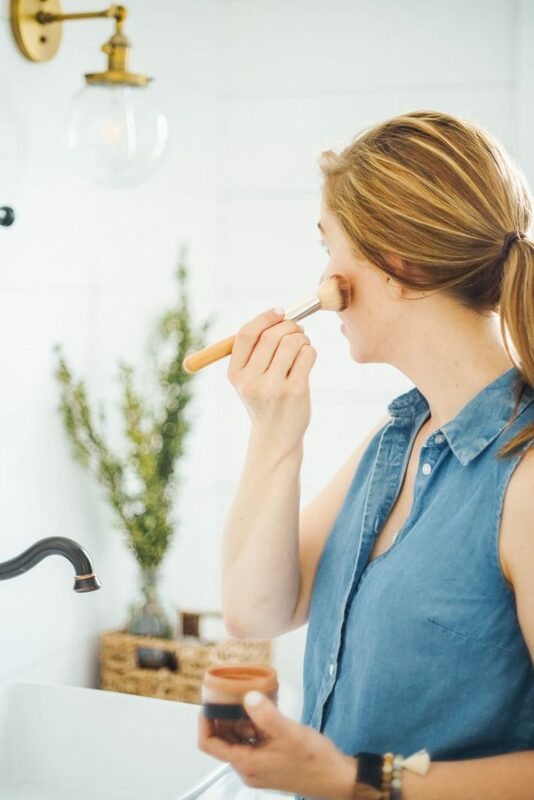 I’ve created a series here on the blog called “Make the Switch” to share my favorite products for everything from cleaning products to shampoo and conditioner and skincare products. You’ll find this series on the blog under “Wellness” and then “Product Suggestions”. Here’s a link that will take you there. I add to the series on a regular basis. 6. Natural Body Care Simplified PDF Guide. 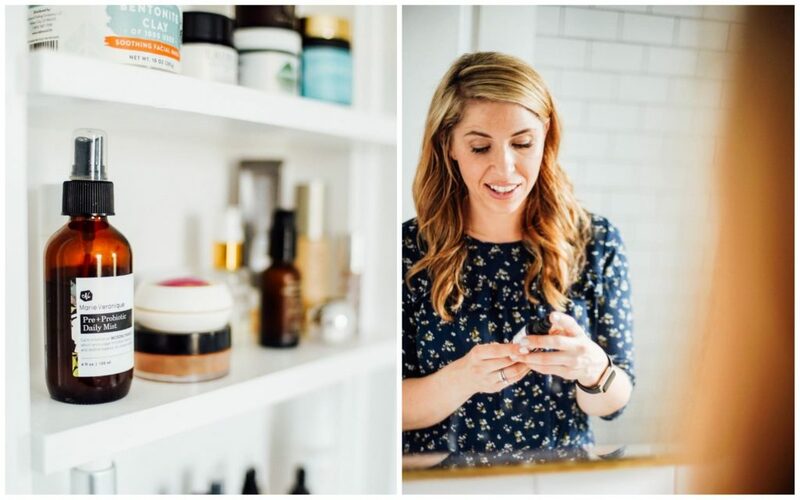 Plus, I share brand and product suggestions to make it easy for you to find trusted store-bought products for everything from nail polish to hair products and makeup. Find the guide, here.